Connecting three or more transmission lines poses the problem of proper impedance matching to minimize standing waves in the system. 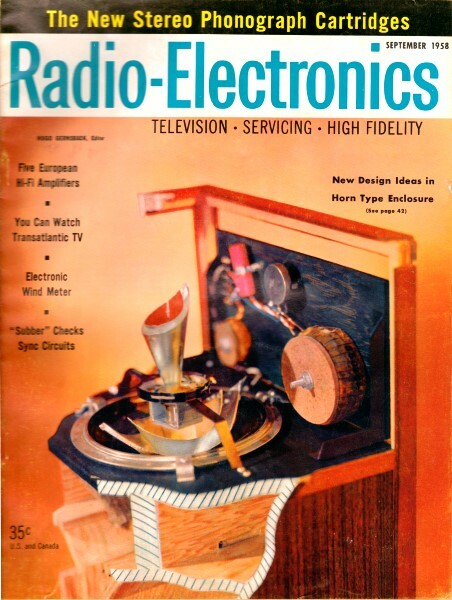 Ideally, lines would be matched with rf impedance-matching transformers which do not dissipate energy. Therefore the rf power would be equally divided among all of the lines. Lines can also be matched properly with ordinary 1/2-watt carbon resistors, if the lines all have the same characteristic impedance and if the power lost in the resistors does not reduce the signal below a usable level. This condition occurs in strong-signal areas where several receivers are connected to a common antenna. Any mismatch can cause standing waves which appear as ghosts on the TV screen. In such areas reduction in signal strength is not important but the match of the rf lines is quite critical. Similar situations occur with test equipment and occasionally in amateur applications. When matching with resistors, two connections are possible. The series resistor connection is used for lines having a common ground, such as coaxial cables. The shunt resistor connection can be used with balanced lines Figs. 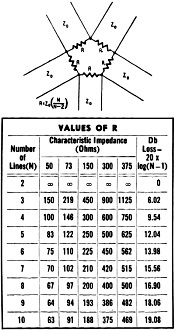 1 and 2 show how the matching networks are connected and give the formulas for calculating the necessary resistor values. 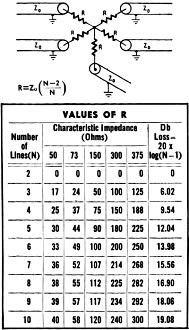 The symbols used in the equations are: Z0 - characteristic impedance of the transmission lines used; N - total number of lines that are joined; R - resistor value required in the diagrams. 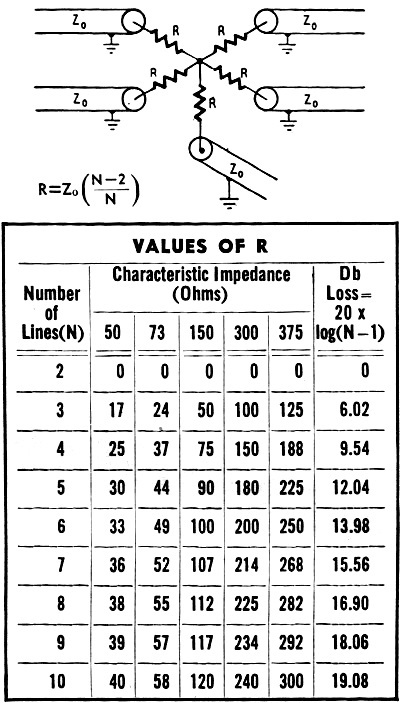 When one of these lines is a signal source, the loss of the network for this signal down to anyone of the other lines is calculated from the equation L = 20 log (N - 1), where L is the loss in db. This equation is the same :for either the series or shunt connection. In the examples of Figs. 1 and 2 five lines are joined; therefore, N is 5. If 300-ohm transmission lines are used, Z0 is 300. 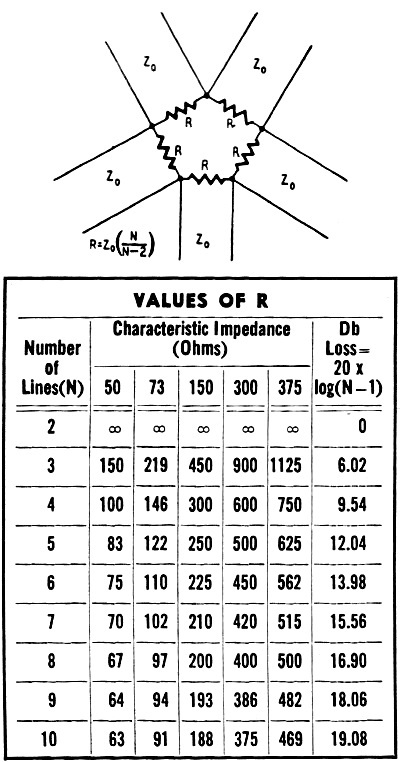 Substituting these values into the equations we find that the required resistance R is 180 ohms for the series connection and 500 ohms for the shunt connection. The signal strength appearing on anyone of the lines will be 12.04 db down from the signal applied to anyone of the other lines. Fig. 1 - Series connecting coaxial lines. Fig. 2 - Shunt connecting two-lead lines. All lines have a common ground.